Sometime in the middle of this hot Greek summer, an idea for a simple knit top was born in my head. The “Last days of summer top”, actually. Why knit, I hear you ask. The truth is that I consider myself a crocheter, but often when a design pops on my head I can usually see the stitches, too. For that particular top, I could clearly see knit stitches. A nice and simple stockinette stitch, for a nice and simple knit top. The problem starts with the fact that I don’t like sewing. So, it had to be circular needles for minimum seaming. 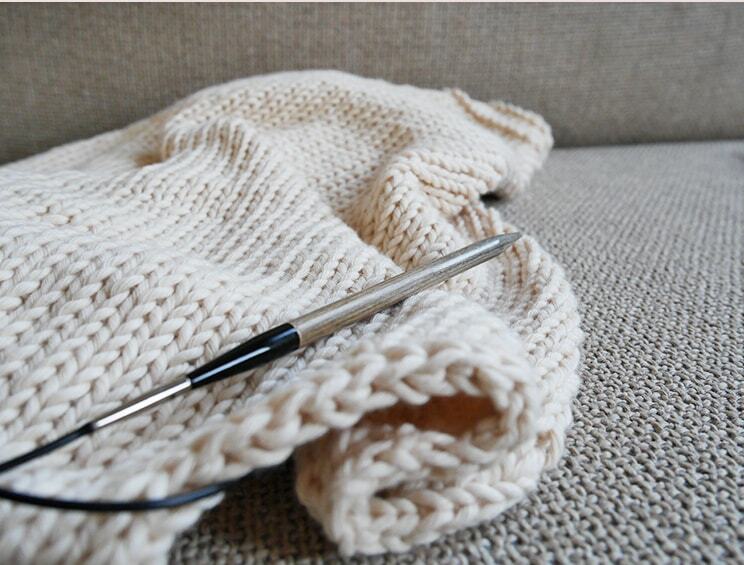 At the time I didn’t even own a set of circular knitting needles, just 2-3 sizes of the straight ones. 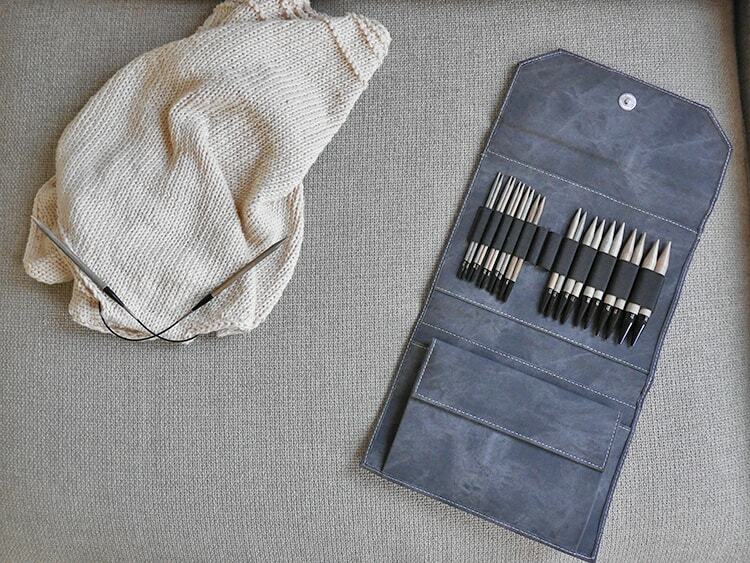 I had my eye on this set of Lykke interchangeable needles for a while now, because…well… look how cute they are! And they are interchangeable! I am a practical girl. The price was the only thing that was holding me back, but I was finally convinced by their lifetime guarantee and well… just look how cute they are, with their grey finish and all! Jokes aside, it is an amazing set of 12 pairs, 5 cords, and a huge pleasure to knit with as the yarn glides so effortlessly on them. The yarn I had in mind for this project was from Wool and The Gang, their Shiny Happy Cotton, and had it delivered to me in jog grey and ivory white. 1. 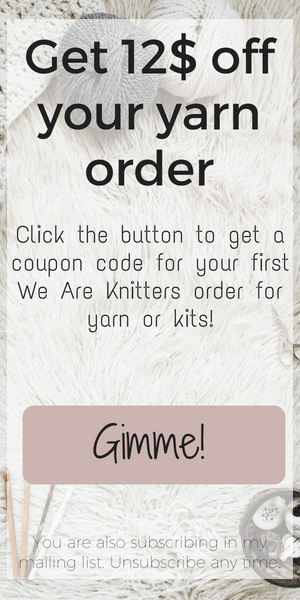 It was my first knitting pattern and was unsure if I could even write a knitting pattern (abbreviations, explanations and all). 2. This was my first garment that needed to fit in different body types, in 3 sizes. 3. The summer was coming to an end and all I had was a sketch in my head, that needed to be knitted, written and send to testers. After arguing with myself that the whole thing was an impossible task, that I could never finish it on time to send it to the testers and still have time to release it that summer, that it was my first knit pattern so there was no way for it to turn out as I had pictured it at the first try, and many, many more… Finally, I won! And went on knitting the damn thing! To this day, I do not know if it was my confidence or beginners luck, but I managed to finish it in just 4 days! And it turned out awesome! Exactly how I pictured it in my head. Seriously, I am in love! I love the athletic and casual look of it. It can be worn morning or evening and it looks great with jeans, shorts or a skirt. 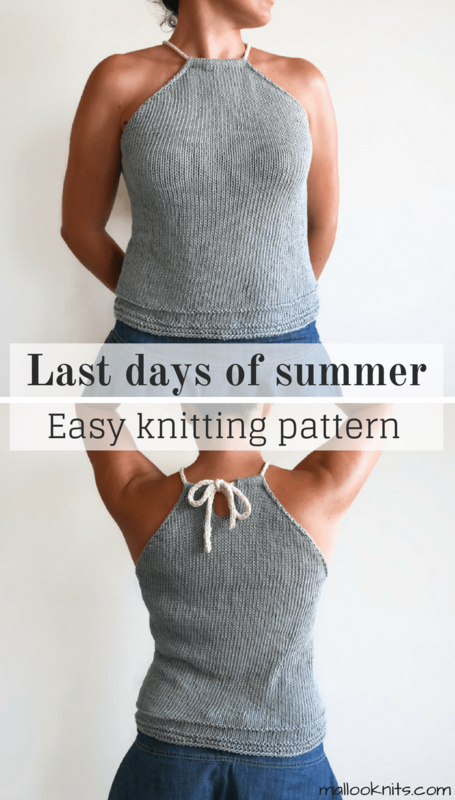 I had so much fun designing this simple knit top and the whole process made me realize a lot of things along the way. One of them is that the limitations you set for yourself are the thing that keeps you back. I have so many things in my mind to say about that, but maybe it deserves a post of its own in the future. And that is the story of how the “Last days of summer top” was born. Actually, it is the first time that I named a pattern before I make it. “Last days of summer” is a very obvious choice and I wanted to be reminded of all the struggle and self-doubt I went through to make it happen. You can purchase the pattern on Etsy and Ravelry. Get over there and show it some love by giving it a heart! Thank you for hearing me rambling about my creative process!